The smell of a curry cooking in a wood fired oven is one of the best smells all year round. This recipe is a ‘two pan wonder’ but feel free to omit the roasted squash if you want to make life a little easier! Heat a little oil in a heavy bottomed casserole dish and add the onions & garlic and season well. Once beginning to soften add the chilli and ginger and cook for 2-3 more minutes before adding all the spices except the garam masala. Once the spices are cooked out and smelling fragrant add half the squash to the pan and stir well for a minute or so before adding the tomatoes and stock. Bring to the boil cover with a lid and pop into the oven for 30minutes. Once the curry has been cooking for 10 minutes, put the remaining squash in a tray, drizzle with olive oil, season and cover with foil. Add the squash tray to the oven. When the squash has cooked for 10 minutes, remove the foil and cook for a further 10 minutes to allow it to colour. Remove the curry from the oven, stir in the garam masala and check the seasoning. Remove the squash tray from the oven and throw the baby spinach into the tray and toss it around with the squash to wilt. 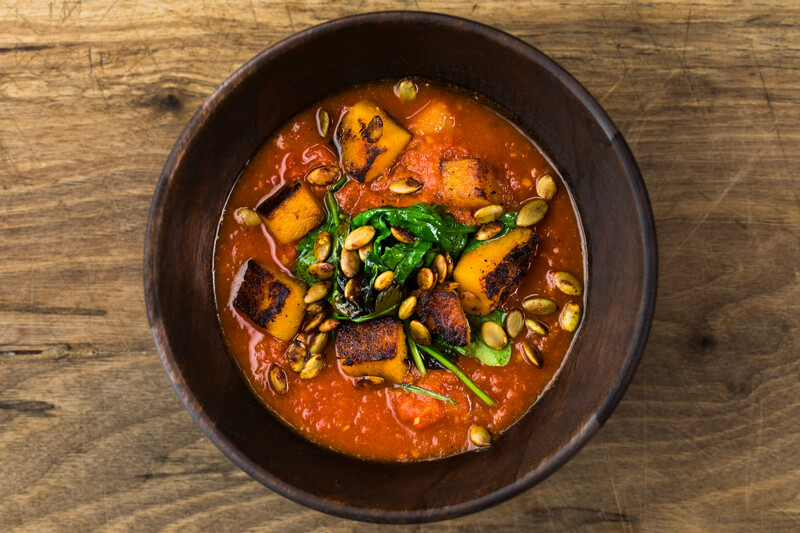 To serve, put the curry in a bowl, top with the roasted squash and spinach before sprinkling over the toasted pumpkin seeds. Serve with rice and flat breads and a little picked coriander.